Pedro Antonio Peña tells us how he met the Way. 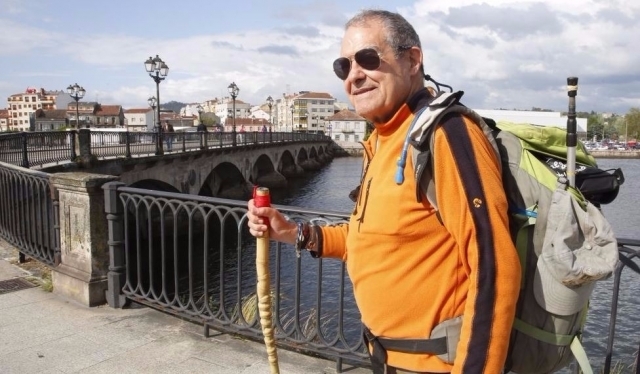 The man of 57 Compostelas, who recently made a break to continue completing some routes, could have traveled more than 34,000 kilometers. "That impact, this idea remained stuck in my ...". Pedro Antonio Peña, everything Marbella 79, is one of the largest professional Camino de Santiago, having sealed and 57 Compostelas. Recently Vive Camino has been long talk with this famous walker, where, besides many other curiosities, has told us how and when you love the Camino de Santiago and what were your first experiences in it. Pedro Antonio recalls that it all started when "I organized my wedding trip in 1963". He proposed to his wife to go to Santiago de Compostela, and decided to spend those days of happiness in the Galician capital. "We went to Santiago for the first time in '63, I saw the Cathedral, I saw everything that was the setting of Santiago. Guardo some very old photos of then, remember ..." says Walker. After this first positive impact of the Galician capital, Pedro Antonio decided to dedicate some of their free time and professional awareness of the Jacobean routes. Remember that, at first, realized the Way in stages, and that their work in hospitality "allowed to get away very often." Whenever he could visit Northern Spain, attracted by the culture and tradition of the Road: "I went from desk manager commercial, and in the end was to take the road and visiting agencies throughout Spain whenever I could my destiny was Galicia. Cantabria, Basque Country and Navarra ". This marbellí ahead their work during the week, leaving the weekend free to know the area. "Input, if I worked five days, tried to do it in four and had insurance purposes week to move around the area took the opportunity to know the area on Saturday and Sunday, and to walk. "His first road was not completed until 1987 and staged, as its first Way "pull" not completed until 1993: "It was Holy Year, and it was when I left from Somport and to Santiago de Compostela That did pull itself. . But before he was doing for pieces, yes, where it ends, it continued ". From a time now Pedro Antonio won much free time, so now walk in the Jacobean routes it is much easier for him in terms of time available, greatly increasing Compostelas achieved. "There came a time when I retire, about 15 years ago, and then there are years that I get to Santiago three or four times, so I uploaded both counts. But to 93, on my vacation, spent 15 days my family and another 15 days for the Way "Pedro Antonio confessed in an amused tone. In future articles you will continue to learn the experience of Pedro Antonio Peña in his years traveling the Camino de Santiago.